Continuing the series of Jubilee initiatives of the “Fridays of Mercy,” this afternoon Pope Francis dedicated his attention to priests. Precisely in the month in which he celebrated the Jubilee of Priests, addressing to them his meditations in the Roman Basilicas (June 2) and celebrating the Eucharist with them in Saint Peter’s Square on the Solemnity of the Sacred Heart of Jesus (June 3), the Pope wished to express his closeness and attention also to those priests who were unable to take part physically in the very beautiful Jubilee celebrations, but who are always present in his prayer and in his heart. Therefore, tireless, the Pope chose not only one but two communities of priests where he went on a visit, in a long and intense afternoon, rich in meetings, emotions, spiritual joy and moments of prayer, after leaving the Vatican before 4:00 pm. The first was the “Mount Thabor” community, where there are eight priests from different dioceses, suffering from differnt forms of hardship, accompanied by Permanent Deacon Ermes Luparia, former Colonel of Aeronautics, now specialized in psychology and dedicated to the service of accompaniment in the spirit of the Salvatorian Fathers. The Pope met with the priests guests in the small chapel, listening to them and praying for them. 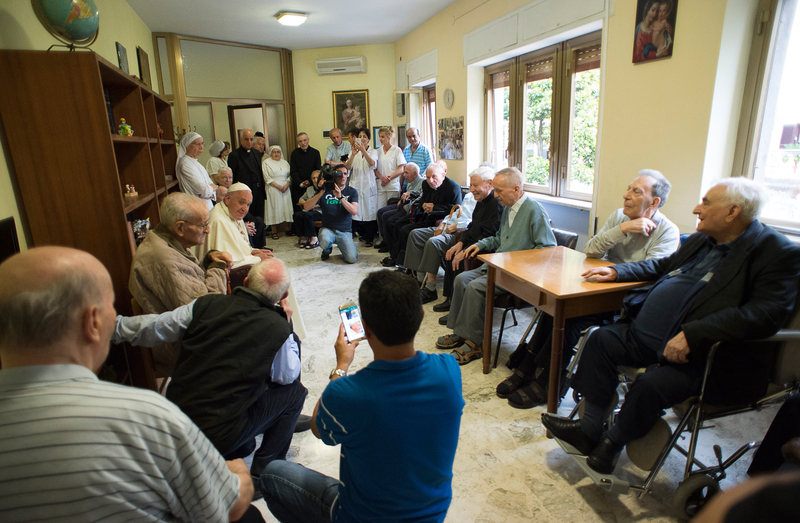 Then Pope Francis went to the community of elderly priests of the Diocese of Rome, called officially “Saint Cajetan’s House,” but better known as “The One Hundred Priests.” At present there are 21 elderly priests there, some of whom are very sick, and assisted by three Sisters and other staff. Father Antonio Antonelli, “Director” of the House was a parish priest for many years and is now himself very ill. In the majority they are diocesan priests, but a few Religious live there as well. After having given their life in the service of the Church and of the faithful, these priests now live in retirement, and not many remember them, but the Pope does, and with this visit, he wished to demonstrate it to each one of them with his very concrete and warm affection, rich in consolation, and, once again, he has given an effective example of mercy, care and gratitude to all the community of Rome and to the Church. In the main, the Jubilee consists of works of mercy both corporal and spiritual. Today’s was the sixth sign of mercy carried out by Pope Francis in the course of the Jubilee: in January he visited a care home for the elderly and the sick; in February a community for drug addicts at Castelgandolfo; in March (Holy Thursday) the Center of Reception for Refugees (CARA) of Castelnuovo di Porto; in April he visited refugees and migrants in Lesbos Island; and in May the “Chicco” community for individuals with serious mental disabilities at Ciampino.